More than 85% of road transport professionals surveyed at the Microlise Transport Conference feel that measures to improve air quality will have a negative financial impact on their business. In addition 92% believe that the needs of the transport industry are not being considered, or are only partially being considered, in relation to the introduction of Clean Air Zones and Low Emission Zones. Moreover, three quarters (74%) think that the Government is unfairly legislating against the transport industry and almost half (44%) feel that running a transport operation is harder now than it was 12 months ago. These were the findings of a poll of more than 1,200 delegates who were attending Europe’s largest road transport conference last week at The Ricoh Arena in Coventry. In the 12 months up until the end of Q3 2017 the road transport industry moved more than 150bn tonnes of goods – a three percent increase on the preceding 12 months. Yet for the same period, vehicles travelled one percent fewer miles than a year earlier, hinting at a more efficient environment for transport operators. New technologies, innovation and a lot of hard work play a major role in achieving this and half of delegates said that they believe the biggest opportunity for the industry lay in the use of technology. Of those polled, two thirds said that they already have alternative fuel vehicles in their fleet and 78% plan to trial alternatively fuelled vehicles as they come to market. Despite this, 65% of respondents said they believe diesel will still be powering more than half of their fleet by 2025. Preventing HGV-related terrorism was also a major topic at the conference, with Scott Gibbons from National Counter Terrorism Policing Headquarters addressing the audience. Asked whether they have made any changes directly as a result of the recent spate of terrorist attacks using vehicles, just under two thirds (63%) of delegates said they had not and a third (37%) said they have no specific processes or policies relating to the issue. 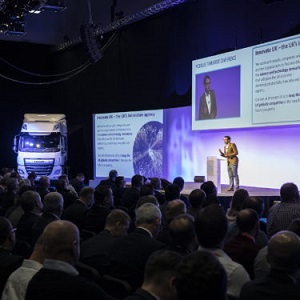 The next Microlise Transport Conference takes place on 15th May 2019. Full details will be published on the event website in due course – www.microliseconference.com.